Berks County has its share of old-school restaurants – especially in and around the city of Reading. 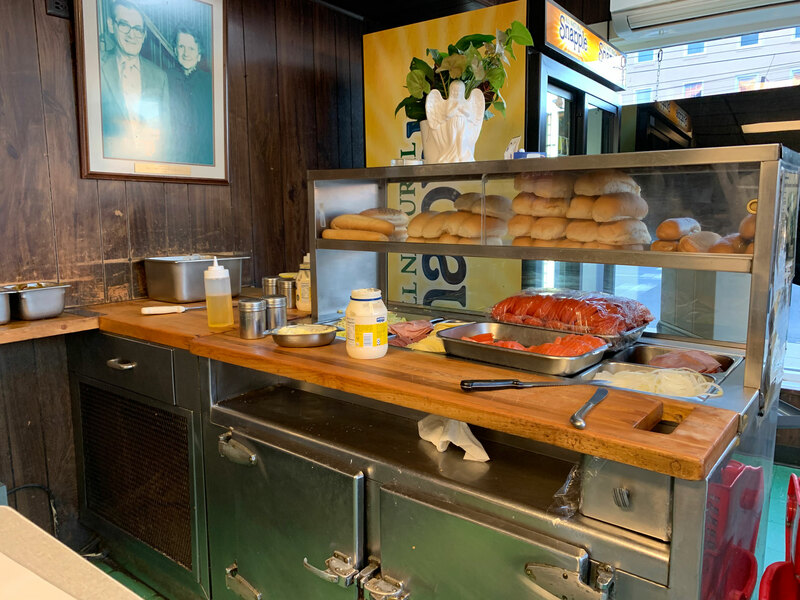 Screpesi’s Sandwich Shop is one of those places, serving customers since 1949 – just four years after World War II ended. If Screpesi’s doesn’t have the smallest menu in Berks County, it’s close. There are eight sandwiches: ham, Italian, tuna, turkey, roast beef, steak, meatball and sausage. And they have three sizes of cheese and one-topping pizza. Deciding on a whim to get subs, I didn’t call ahead. Instead, I made the quick drive along Route 422 to Lancaster Avenue. 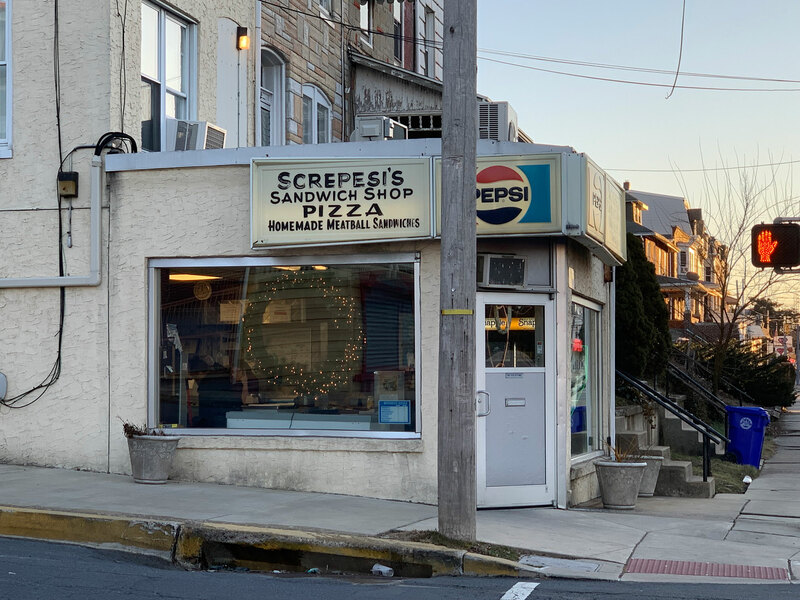 Screpesi’s small storefront is on the corner opposite one of our favorites, Romano’s Chicago Style Pizza. Afghan Chicken & Gyro and a brand new Wawa fill the other two corners. But Screpesi’s is smallest of the storefronts, looking like an afterthought on a block full of townhomes. Two backlit signs face the streets – one promoting pizza and homemade meatball sandwiches; the other, more faded sign promotes ham on roll, Italian, tuna and steak. If the wood paneled walls and green tiled floor aren’t original, they’ve been there for decades. There are no seats – it’s take-out only. On one wall is a portrait of the founders, Mr. and Mrs. Joseph Screpesi, dated 1949. There were three young women – high school or college aged – working when I arrived. Two behind the counter and one who had just finished mopping. I know because she had the mop propped next to her as she restocked the potato chips. I had to climb over it to get my bottle of orange cream Kutztown Soda from the drink cooler. Getting my food was a lot easier, and really quick. I was in and out of the shop in about five minutes, heading home with two sandwiches, two bags of chips, and the aforementioned Kutztown soda for $16. 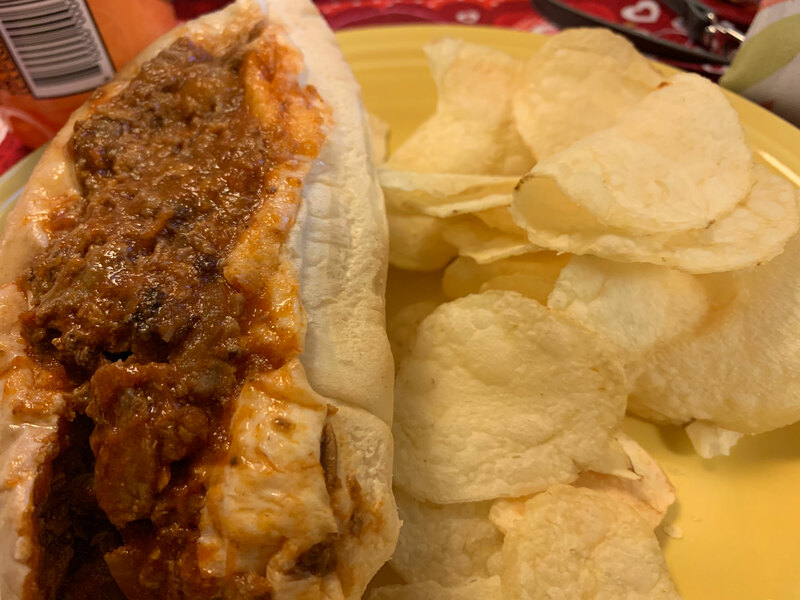 I ordered a steak sandwich and Screpesi’s does them Berks County style – chopped steak meat in sauce with onions (and served on a roll from Reading’s ATV bakery). I didn’t expect much when I saw them dish it out from the pot on the stove, but I have to say, it was much better than expected. What I liked most about it was that the sauce wasn’t too heavy. Most of the flavor came from the meat (and a little grease). I was honestly amazed that the soft roll stood up to the filling, but it did. And I actually really enjoyed it. 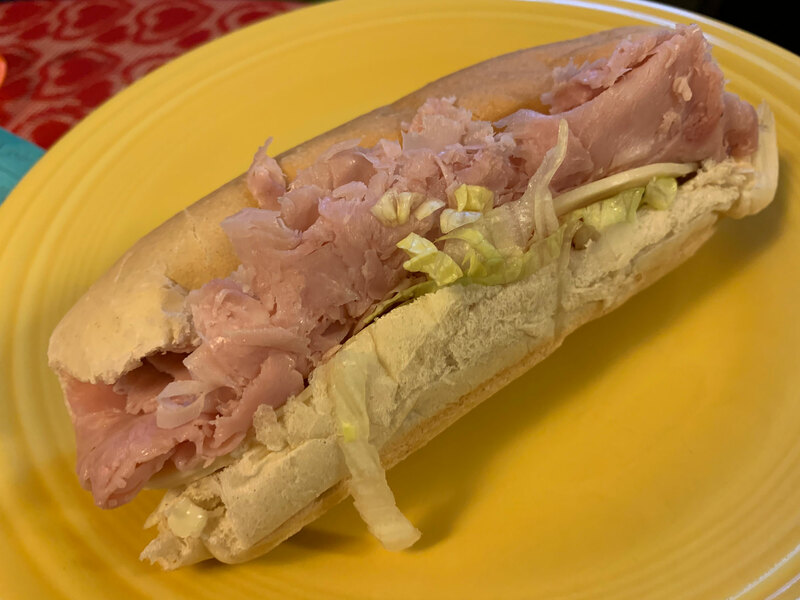 Julie had me grab her a ham on roll after seeing it promoted as the “Best ham on roll in Berks County.” She had it topped with cheese, lettuce, tomato and mayo. Normally, she orders turkey or tuna when she gets a sub, but she thought the ham on roll was really good. The roll, itself, was very good. And all of the ingredients were good, which added up to an excellent sandwich. 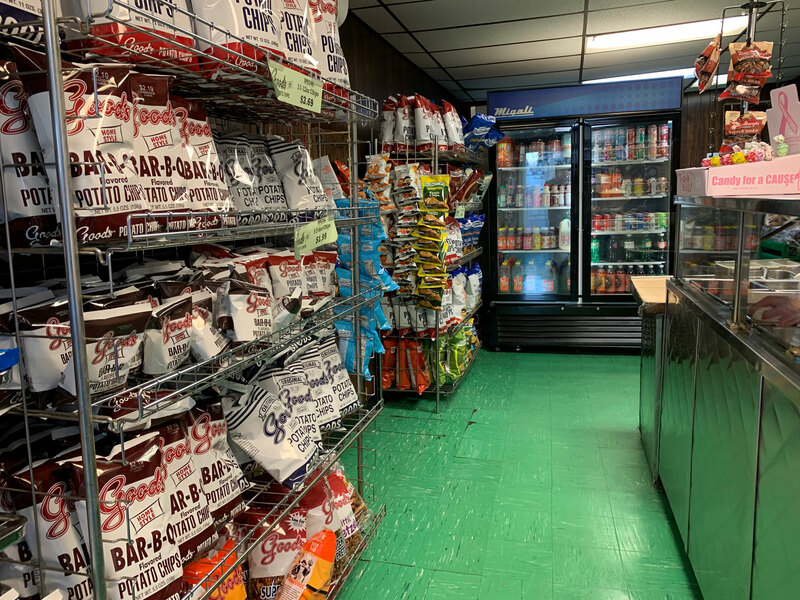 It’s also worth mentioning the selection of Good’s and Dieffenbach’s snacks (I grabbed bags of Good’s chips – the red bag, of course) and local drinks that included Kutztown soda, Clover Farms teas and milk, and cans of A-Treat. 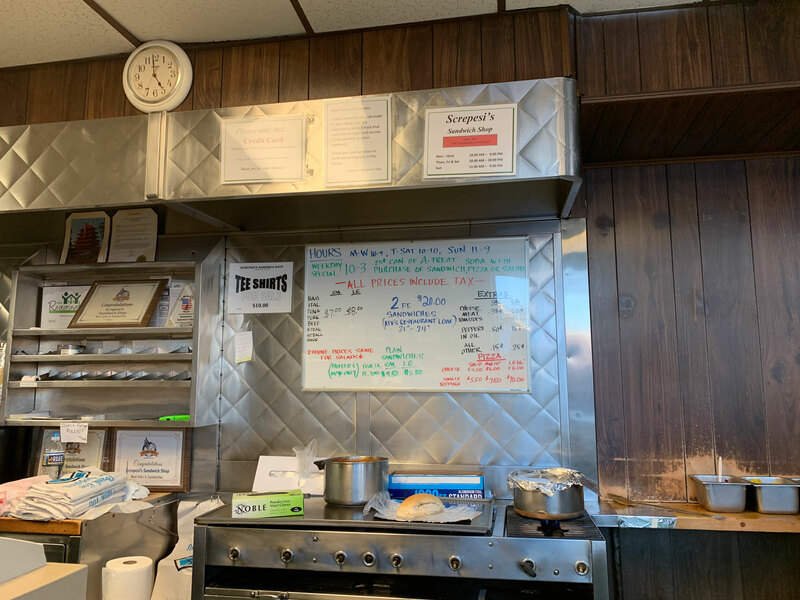 Yes, this old-school sandwich shop is about as Berks County as it gets.